I have three cats (momma cat and two of her 4 month old kittens) and I discovered a while ago that one of them usually cries her eyes out. It's a clear secretion, no signs of wounds or pain whatsoever. I took him to the vet but he didn't give much importance..he said something about the tear ducts and blah blah but no diagnosis at all. Sometimes it's just one eye, sometimes it's both, and I really can't figure what triggers it. Should I be worried? What could it be? It may be a tear duct infection or it could be allergies... Whatever it is though I suggest making sure her eyes are clean at all times if it's an infection or a flu it could build up and shut her eyes and that can be very bad. Other then keeping her eyes clean you can try wiping them with a cotton ball that you dip in some warm water or make some tea no sugar just the bag in hot water, let it cool off almost completely and dip the cotton ball inside clean and press lightly in the area, that will help sooth the eyes and help if she has an infection, I always do this to kittens if they have the flu or have an infection and it works great! I would suggest taking the cat back to the vet and ask him to test the "tear" to see what it is but until then it is important to keep it very clean so it won't get worse. If it was an infection it would have spread to all your cats. I know it sounds bad but that's what infections are. He'd also (most likely) have other symptoms like sneezing or nasal discharge. If the other cats are OK, I'm inclined to think it's an allergy. So for how long exactly has it been happening? Does it trouble him? I'm a little surprised the vet didn't care to do some tests at least. He's either very skilled and can tell one disease from another just looking at an animal, or he's careless about his job. If your cat doesn't get better in a few days or you notice other symptoms, try to find another vet to show him to. Get some L-lysine and start giving it to them regularly. They may be having allergies. I'd also start wiping them down with hypoallergenic kitty wipes to get dust and everything else off of their coats. Try changing their cat litter to something with the least dust you can get. I use Dr. Elsey's Precious cat, respiratory relief, works great! It doesn't seem to bad to me, maybe just an allergy to pollen or something else in the air, or anything new he has eaten? Joleen Cohen's tea advice is very good. Lauren's reply was promoted to an answer. Lauren If it was an infection it would have spread to all your cats. That's what I thought. I guess it's been happening for like a month or so and he doesn't show any other symptoms, even when his eyes are wet, he acts normal. I didn't change the food and they're indoor cats, but the weather here is getting very humid so maybe it has to do with that? Anyways, I'll take him to another vet if it doesn't stop. alfinnlay's reply was promoted to an answer. Yeah if he's had it for a month it's probably allergies like lauren said there would be signs by now if it were an infection. It makes sense too because the weather is changing right now it and there are many things in the air that could cause allergies. alfinnlay, I'm afraid there are no such things here in Uruguay. There might be antibiotic eyedrops at most, but I should ask the vet anyways. There has to be something, I mean...uruguayan cats can get allergies too! Oh l-lysine is an amino acid, so it's a available if you have a vitamin store? LOL, yes I'm sure they can get allergies too. Still wash them down with even wet paper towels if you can. Anything to get the dust and stuff off of them. 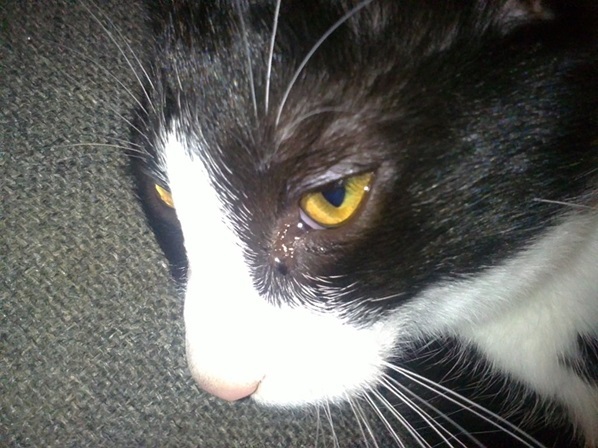 Cat's Eyes Become Watery After Eating?